Easons, which once had ambitions to launch its own ereader, has joined forces with Kobo. The deal will see Easons selling Kobo devices in its 60 stores and has attracted little negative comment unlike Waterstones deal with Amazon last year. In fact it seems, so far, to have been pretty universally welcomed in the Irish trade. Easons has, despite the aforementioned ambitions, chosen the path of least expense with regard to making its ebook offering credible and coherent. That meant, although its e-store concept was attractive, it was selling several different brands of device and its ebook platform was off the shelf and was not always as smooth as possible. What’s more its options were somewhat limited. Tesco has been selling Kindle ereaders since before last Christmas at prices well under €100 and Amazon has spent hundreds f millions making those devices and the ecosystem surrounding them, very user-friendly. The Waterstones Kindle match-up has sat oddly with the trade, the deal has also put Kindle ereaders and tablets in front of readers in many places. So Easons has been faced by deep pocketed rivals and the most likely platform partner already pretty much wrapped up with rivals. We don’t yet know how successful this move to partner with Kobo will be. Easons is still offering Sony ereaders from its website (on 2nd November) and Kobo’s ebook offering not yet live through the retailer’s website either. Even so, Kobo has launched a new consumer facing ebook site for Ireland which will surely power Easons ebook store when the partnerships rolls out properly. The site’s not perfect yet, for instance, I can’t yet find out where to but one of the company’s tablets in Ireland yet, but that’s an easily resolved issue. Irish facing stores are a rarity in the ebook space, on Kindle, users must choose between buying their ebooks from Amazon.com or Amazon.co.uk. While the process is fine and workable, it still presents pricing challenges and means picking out Irish bestsellers can be hard. Apple offers an Irish facing ebook store but there’s every indicator that sales through the store have been relatively low. The bigger question for me is what will all this mean for ebooks in Ireland. The last year or so has seen most Irish publishers begin to take ebooks very seriously with some publishers quietly indicating that digital sales are no accounting for double-digit percentages of units sold (though often a lower percentage of revenue given the disparity in price). The best indications I’ve seen suggest that while fiction is the leader, there are some fine performances in non-fiction too and that backlist is proving its worth yet again. Interestingly, Conor Whelan, Easons MD, said at the launch of the Kobo/Easons partnership (which took place at the launch of Kobo’s new Irish offices, itself during the Dublin Web Summit) that: “One in five books sold on Easons.com are ebooks” a fact that sailed over many people’s heads, but struck me as a very nice nugget of information. It indicates that Easons is doing much better at selling ebooks on its own than we might previously have imagined, thus suggesting the Kobo partnership might really drive ebook take up and sales in Ireland if it can connect with readers. I’m intrigued that the offering will include more that just the ereaders. Kobo’s tablet offering is really quiet good (in the non-iPad league that is) and at €149.99, the Kobo Arc 7 will provide Easons with a reason to get non-readers in the door that the ereaders on their own simply will not. In fact at that kind of price point, the tablet may well be the most attractive part of the device line up. 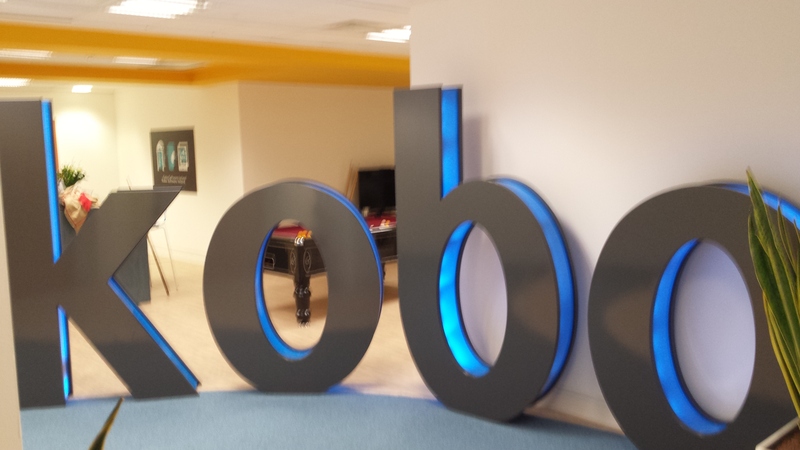 Kobo has found a strong partner to grow mind-share and market share in Easons. It does have a very large presence on the high streets of Ireland as well as an impressive brand and awareness in Irish readers mindsets. The company also runs highly successful media campaigns in the run-up to Christmas and ereaders and tablets will be a leading gift category yet again in 2013 and ebooks still have lots of room for growth in Ireland. The problem is that Kindle is dominant and massively so, and will not be pushed aside easily. It will require a by a determined new brand and dogged execution both on the device side of things (which means hoping Easons can deliver) and on the ebook sales and promotion side of things (which means work for Kobo and its staff). It does seem to me though that even if Kobo only manages to build a secure second player position, it could be to both its and Easons advantage. It the companies can make it work, we might begin to see the kinds of percentages that the US & UK have been seeing over the last year or 25-30% units being sold in digital form. Some of the most interesting news in Irish publishing for some time tripped across my phone line and email inbox last night. The Gill Family has bought out Macmillan’s 50% share of one of Ireland’s largest trade and educational publishers, Gill & Macmillan. It’s a fascinating move on many fronts. Firstly it’s nice to see such a large element of the Irish trade firmly in local hands, that’s healthy for the Irish industry given how heavily exposed to outside publishers it already is. Secondly it indicates that Macmillan’s strategic interests no longer include holding such a complex position in a joint venture like G&M. 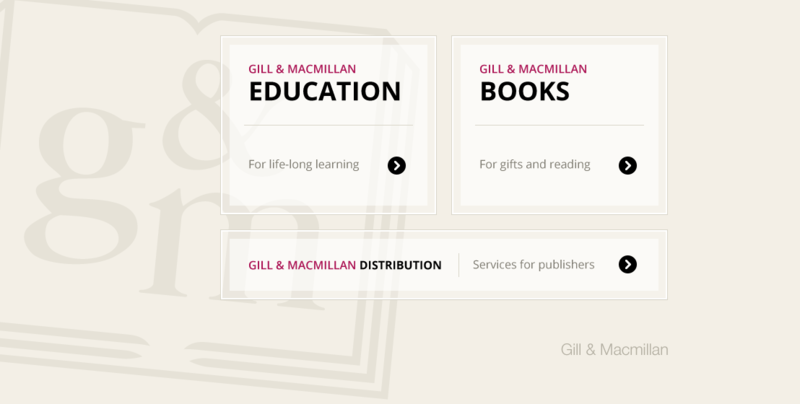 Lastly it lays the ground for interesting years ahead as the newly focused Gill (no longer & Macmillan?) faces the challenge of Penguin Random House which controls a large chunk of Irish publishing. The Gill family and Macmillan Science and Education, joint owners of Dublin-based publishing company, Gill & Macmillan, have announced that the Gill family has taken full ownership of the company. The new ownership structure will have no trading consequences for the business and the Gill family, alongside the company’s Management Team, looks forward to building on its current success. A change in name and branding will take place at a later stage. Gill & Macmillan was founded forty-five years ago in 1968 when Macmillan acquired an interest in the long-established Irish company, M. H. Gill & Son Ltd. Since then the company has become one of the most prominent book publishing and publishing services companies in Ireland. Publishing educational content for Irish schools and colleges has been a major part of Gill & Macmillan’s activities since its foundation. The company is also Ireland’s largest trade publisher as well as providing distribution services to the majority of the country’s independent publishers. This development marks the next chapter for the Gill family, whose name has been synonymous with books in Ireland for 180 years, since Michael Henry Gill was appointed printer to Dublin University in 1833. Six generations of the family have now been actively involved in management of the business. Michael Gill, Chairman of Gill & Macmillan said: “This is a very positive development for the company. Now wholly Irish-owned again and continuing to employ more than 70 talented and energetic people here in Dublin, we are excited by the transformative power and many opportunities and challenges provided by the digital age, both in Ireland and worldwide”. The financial details of the sale have not been disclosed. Macmillan Science and Education, part of the Holzbrinck Publishing Group, is home to the Macmillan businesses which empower those with curious minds to achieve great things. Through the provision of high-quality content and services to scientists, educationalists, students and academics around the world, Macmillan is changing the way students learn, teachers teach and scientists discover. Operating in over 50 countries with some 5000 employees, the division consists of Nature Publishing Group (NPG), Palgrave Macmillan, Macmillan Education, Macmillan Higher Education, Digital Science, Digital Education and Macmillan New Ventures. For more information, please see http://www.learndiscover.com. Gill & Macmillan is the most prominent book publishing company in Ireland. Drawing on more than one hundred previous years of tradition and experience, Gill & Macmillan publishes educational content for primary and secondary schools as well text books for university, college and further-education courses. Its trade division publishes widely in history, politics, current affairs, sport, entertainment and lifestyle. The company has met the emergence of digital communication by providing e-book versions its bestselling titles alongside a rapidly evolving range of digital resources and tools for teachers and students. The company also provides a comprehensive distribution service for the majority of independent Irish trade publishers. For more information, please see http://www.gillmacmillan.ie. There’s also a fascinating piece with the editor of the Irish Independent talking about the digital change going on at Independent (kicks off around 13.00 mins or so) and Brian Fallon from Distilled media talking about TheJournal.ie and the other brands in that group. The basic numbers are clear. The data shows that the e-book market for traditionally published digital books is much bigger than previously thought, with estimates suggesting that a total number of 65 million e-books were sold in 2012, representing a value of about £200m – at least double what it was in 2011 in volume terms more than double. That would mean the overall book market grew in 2012, despite spending on print books falling £74m. via E-book sales data, the truth is out there | FutureBook. Even allow for the fact that the Nielsen numbers for Ireland are widely seen as covering maybe 80% of sales, we can assume fairly happily that Irish print sales were well less that €150m and 15m units at the retail level. Which when you think about it means that the ebook market, just for the UK is already bigger than the entire print market in Ireland. There’s no reason an Irish publisher cant attack that space aggressively and with relevant ebooks just as well as a UK based publisher. What’s more, even if we assume a smaller growth rate for that digital share (say 10 or 20% in 2013) the market will STILL be larger than the Irish market and the space for growth is STILL more significant that that for most Irish publishers in print form. Publishers committed to print or still unconvinced by digital sales, the alarm is ringing and you’ve pressed snooze once too many times, ignore it once more and the alarm will stop warning you and you’ll sleep through this change! *They’ve also excluded some 20p bestsellers. Which I find a little odd, but I can see where they were coming from. Personally, I would have included them. Yesterday I was a little unfair to Easons for the pronouncements of the company’s spokesperson and the tone of the article on its ebook strategy which suggested the company was about to embark on a mission to build a rival platform to B&N and Amazon, something that would surely have been a valiant, if doomed, effort. The first and the last points there are pretty radical statements. The first represents a huge change to the Irish experience of the book industry. Right now in print terms, most books bought by Irish consumers are sold to them by Irish retailers, Easons the principle one but others like Dubray, The Book Centres, Kenny’s, O’Mahony’s, Hughes & Hughes and many many others. That is despite the growth of physical sales through Amazon and the internationally owned (except for Dunnes Stores) supermarket chains. The wholesale and distribution businesses are also heavily Irish owned (with some British presence, increasingly on the Library supply side of things). But the situation is dramatically different on the ebook side of the house. Easons is the only ebook retailer of note in the Irish context (others should shout out if I’ve unfairly missed them out). On the ebook distribution side, EpubDirect are the only (and admittedly impressive) crew actually making a go of that business and even they don’t make up for the fact that the majority of ebooks sold in Ireland will have been distributed through other channels. The only ebook store that really seems to cater specifically for the Irish ebook market is Apple’s iTunes so when Irish publishers do start to make content available they have to fight against ALL the published content there is, not just all the domestically published content and all the UK published content as they do in the print world. Further the people making decisions about ebook merchandising are rarely based in Ireland as once they were (or indeed still are in the print world) and therefore open to some discussion or indeed charm (not inconsiderable amounts of which the Irish are possessed). You see the problem. The Irish publishing industry is fast running into what might be described as some fashion of an ‘Outside Context Problem‘ wherein the new arrivals on the scene are vastly superior in terms of abilities, vastly superior in terms of resources and possessed of superior technology. While some of the participants in the market might grasp the nature of the problem and respond as effectively as they can, the truth is that the disparity in attributes makes success unlikely and the new threat is very much an existential one. Which sounds very dramatic but think of it this way. The Irish consumer market for trade books is around €150 million a year and 15 million units all in. Suppose only 30% shifts digital over time or €45 million and 4.5 million units. That would leave only €105 million up for grabs for Irish retailers in print form and 10.5 million units. The impact on stores, book publishers and other market participants would be pretty dramatic. There would be closures and job losses and the industry would be considerably weaker. And that’s just the impact on the retail side of the trade. The impact on the publishing side of the trade is unknowable, but there is little doubt that it would be significant and would probably be negative for the domestic publishers (see my earlier paragraph on why). The UK publishers will probably cede sales to US-based publishers, especially if US publishers seek to enforce global ebook rights deals on authors. We are probably headed in the direction of 30% digital pretty quickly. If we even approach the kind of conversion to digital sales that seems to be happening in the US or even the UK, we can expect that 30% figure to be a reality by 2015. By then the Irish industry will have changed radically and will become almost unstoppably more international not just in terms of the books that sell her, but also in terms of those who sell them. US publishers will probably be the second biggest publishers of ebooks bought by Irish readers (if not the first having overtaken the UK). Frustratingly the APP did not share details for Ireland (those were contained in the full report but not as a single territory, rather as part of a larger group of English language territories) so we don’t know how well those publishers are doing here. Still, we can assume that they did well relative to the size of the market. What’s more, Ireland and the story of change in the publishing industry really acts as a microcosm for the rest of the English language publishing industry (indeed it acts as a microcosm for any small market which shares a language with a much larger market be it French or German or Spanish or Chinese). In some ways the whole industry is encountering the ‘Outside Context Problem’ I mentioned earlier as software and technology firms move into a traditionally physical business, but for larger companies, responding can be easier because of their scale and their resources make for a wider context as it were. It’s the small markets where the combination of these larger players and the changes in technology make for such a difficult problem. Beautiful day here in Dublin! Interestingly (or maybe just interesting for me) I wrote some time ago about the impact of divergent rates of digital growth on small markets, and in many ways this post is all about that impact. The increasing internationalization of the Irish publishing industry is driven by the very issue I highlighted: Divergent Growth Rates In Digital. There has been some grumbling (I’ve a note coming on that later) about the slow pace of digital take up in the US in the last few days and weeks. I’ve a feeling that has as much to do with the now higher benchmarks the digital market is growing from. By which I mean if the ebook market is worth $1 million then to double it need only increase by $1 million however when the market is $100 million it needs to increase by $100 million to double and when it is a $1 billion it must grow by a full $1 billion in order to double. Needless to say whereas $1 million in increased sales is hard to find, $1 billion is considerably harder. On top of that, there is a real need to break analysis into markets to account for different market conditions. The UK is not the US and Ireland is not the UK. What’s more a UK publisher must react to UK market conditions. This has echoes of some of my thoughts about different rates of digital change from 2010. For instance, the UK is in the midst of a huge shift to digital BUT that shift has really happened over the last few months. 1.3 million ereaders were sold over the Christmas period and the UK market has as a consequence flourished since December. Which makes the Quercus numbers all the more interesting. In 2011 digital sales accounted for 11% of their revenue, but grew 270% in December 2011 when compared to December 2010 promising a nice digital year in 2012. We continue to benefit from our significant investments in digital publishing and marketing, website development and social networking. For the year as a whole, Quercus generated approximately 11% of its income from digital revenues, while the growth in ownership of eReading devices over the Christmas period contributed to an increase in eBook sales of 270% in comparison with the previous December. via Quercus Christmas trading update | Quercus Books. It’s entirely possible that many of those ereaders will remain idle, many will fall out of use, but enough will remain active to shift yet more readers who were once print dedicated into either digital dedicated reading or hybrid print/digital status. If those readers are heavy readers (as I suspect they will primarily be, after all why give someone who reads one book a year an ereader?) that will shift considerable numbers of digital units in 2012. So the UK situation is very different to the US situation. We should avoid blanket statements. Hachette Ireland has promoted commissioning editor Ciara Doorley to the position of editorial director, effective immediately. via Doorley new Hachette Ireland editorial director | The Bookseller.